On the train out of Euston for Glasgow again. 3 days ago the bike was still clamped firmly in the bike stand, in the middle of a pre tour service. Panniers still on top of the wardrobe, flat and unfilled. Not a thing laid out on the bed in barely organised pre packing piles. Eeeek! Actually, I wasn’t that worried. It’s only a month. And I will be cycling in the Highlands and Islands not crossing continents. Still can’t persuade myself to use the front rack on the Roberts. I should really remove it..I have used it once in eight years. The thought of lugging four bags on and off the bike in order to access whatever form of mass transport I might have to use at some point on my trips, encourages very light packing. Which is fairly easy in summer. Winter trips are a little trickier when just a winter fleece and winter sleeping bag can fill one pannier on their own. 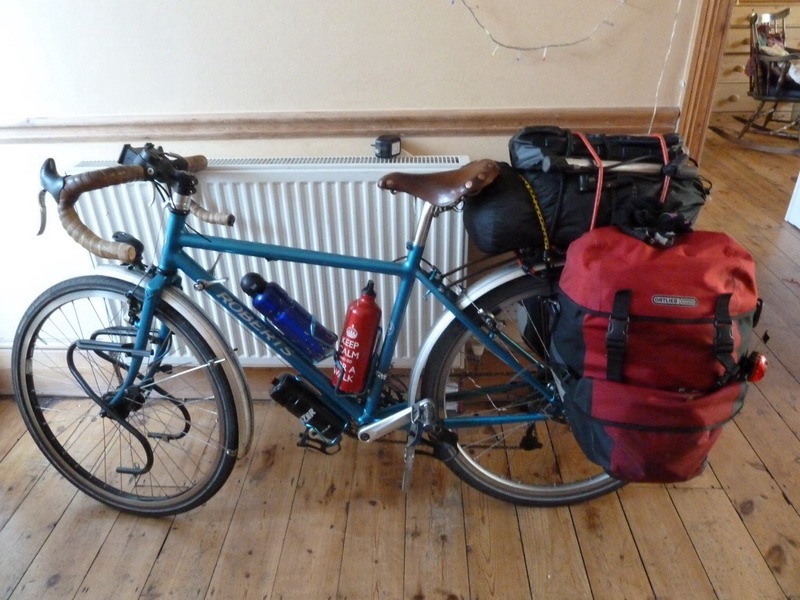 But, ironically, now I finally have a bike fitted out to take that volume of kit, I am doing fewer winter journeys and feeling less like camping when I do them. Getting old, I guess. It’s a long time since I have ridden a loaded tourer through Central London in rush hour. I usually make sure my train departure enables a cross London journey at quieter times. But the availability of a very cheap ticket meant I was riding up Blackfriars Rd at the tail end of the rush hour, and forced to sit in the stream of heat belching engines rather than heading up the jam on the right as I would usually do on the singlespeed. The Roberts Roughstuff is a great bike, but it’s not made for traffic jamming. With it’s long wheelbase and big load on the back it’s secure, steady, strong and stable but not nippy! And nowhere near as fast and manoeuvrable as the Holdsworth, the bike on which I am usually to be found riding around city streets. But, I had plenty of time, so just sat patiently, the only downside being the copious amounts of polluting particulates I was being forced to inhale…not a pleasant thought, especially for an asthmatic, like me. But, I would still rather ride these streets, than drive them (how mad an idea is driving in London?) or cram myself into a tiny space on a bus, tube or overground train, where I am forced to breathe in a variety of bodily odours belonging to a diverse and large number of human beings, along with the manufactured odours they have purchased and, often far too copiously, applied to mask them. And still faster than any other way of getting here from Southeast London, even on my magnificent beast of burden that was never built for speed. Sounds fun! Any chance of our paths crossing in a few weeks? http://velovoice.blogspot.co.uk/2014/05/scottour-10-days-of-scottish-heaven.html We’re mostly on Skye but will take 2 days getting down to Fort William (Sat-Sun 21st-22nd June). Staying in Invergarry the Saturday night, if you happen to be going up/down the Great Glen or en route to/from western isles. Oh, shame! I am heading back on the 19th June….I have commitments I can’t avoid back in London….have fun the pair of you.